In a mixing bowl, combine 2 1/4 c flour, sugar, salt. Add yeast & lukewarm milk mixture. Combine. Add egg. Using the dough hook attachment on your mixer, knead while gradually adding in 1 c flour until the dough forms a ball & pulls aways from the edges of the bowl. You can also knead by hand. On a floured surface, roll out dough into a rectangle. Spread melted butter on top. Combine cinnamon & sugar & sprinkle on top. Using a knife or pizza cutter, cut 10 strips. 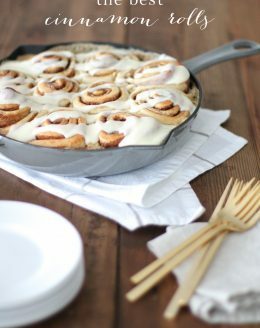 Roll & place in a baking dish or cast iron skillet. Turn oven off. Cover rolls with a damp towel & allow to rise 25 minutes. Remove from oven, preheat again to 350 degrees. Cover rolls in 1/4 c heavy cream. Bake 15-20 minutes, or until slightly golden. Mix icing ingredients until smooth & drizzle over rolls.